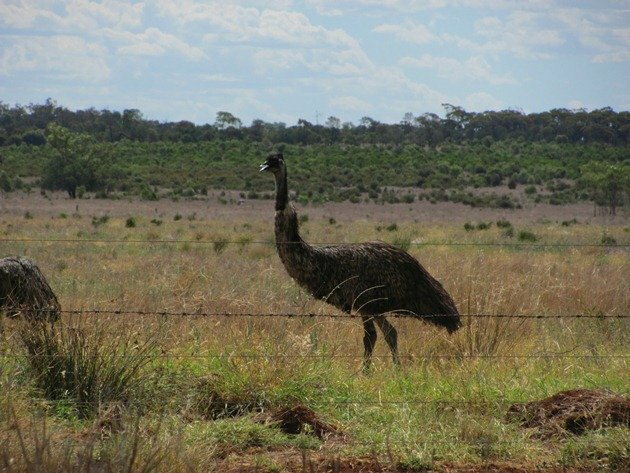 The Emu Dromaius novaehollandiae is Australia’s largest bird standing at up to 2 metres (6 foot 6 inches) tall. 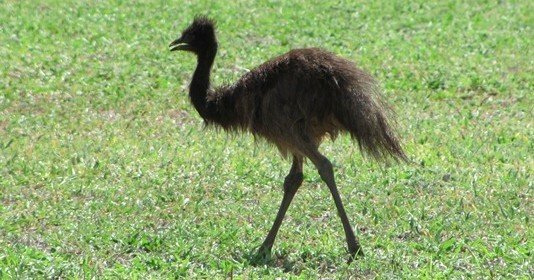 Although it is flightless it is able to run at considerable speed and it is not uncommon to have them running alongside your vehicle at up to 50km/hr (31mph). They are also inquisitive, so if you observe some near the edge of the road and you want to gain their attention you can turn on your car indicators and they will often investigate rather than run off. They are nomadic and roam looking for food, which is predominately vegetation and therefore they distribute seeds as they roam. They will only breed if the conditions are good and the male will be responsible for nest building and incubating the 6-12 eggs for approximately 60 days. 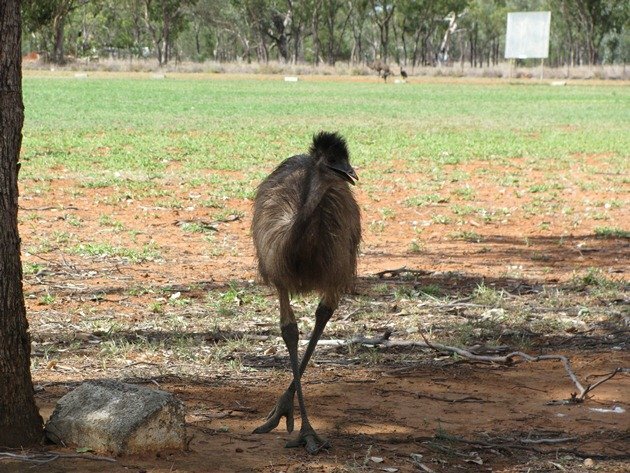 He will then rear the young Emu for up to 18 months. 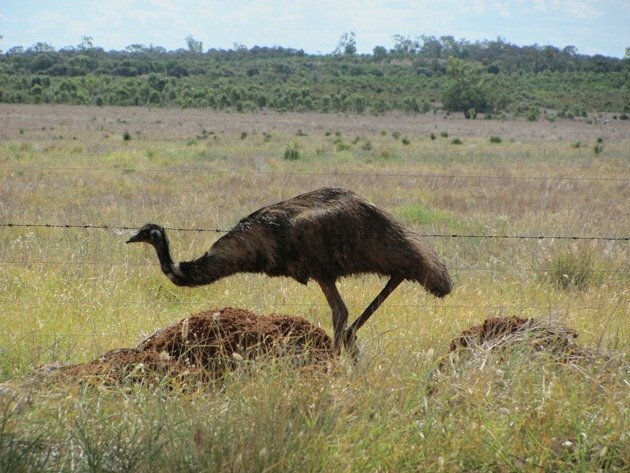 On our recent visit to southern Queensland we encountered Emu once we had crossed the Great Dividing Range and entered the semi-arid areas to the west. There had been good rains the previous year and as a result of that there were numerous family groups. 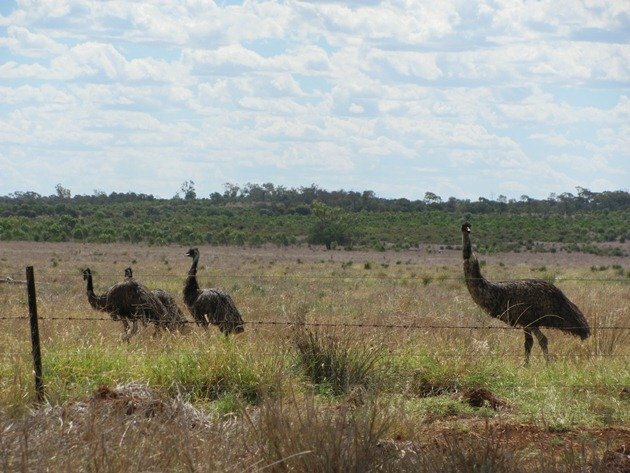 The male Emu had between 5 and 8 young Emu to care for and it was amusing to watch him use his long neck to “round them up” and keep them under control. Barely a few minutes would go by before we saw another family group as we travelled along and they were quite happy to wander into small towns and take advantage of the grass on the town sports field. 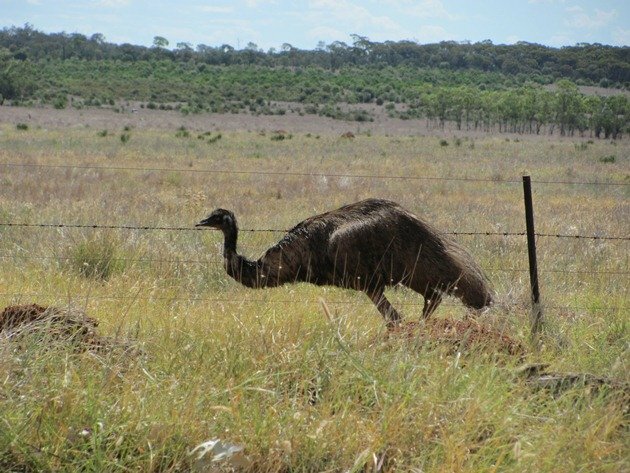 Beyond the towns the Emu wander across the Outback and they are undeterred by fences. 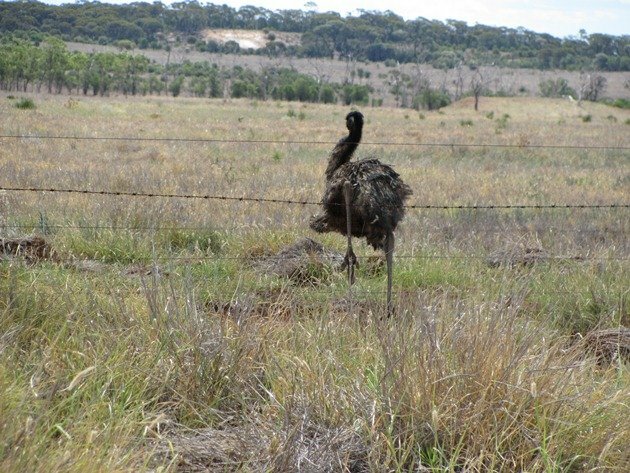 In actual fact we saw one take on an electric fence over 20 years ago in the Murchison area of Western Australia and it persisted until it got through. 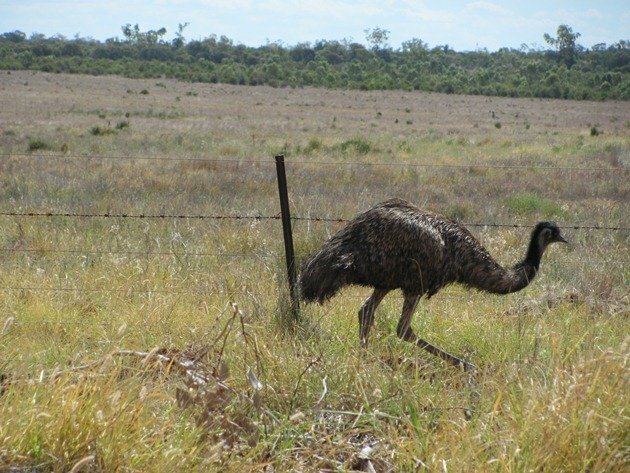 In Queensland we came across a family that had crossed the road as we approached and we then waited to observe them taking on the challenge of another fence, which included barbed wire. Emu have dense double-shafted feathers and with this protection they are able to make it through unharmed. They went through one by one until they had all made it through and continued wandering across the Outback looking for food. They can make substantial damage to crops due to their large feet and their random wandering rather than walking the edge of a crop. A fence of this height is not going to slow down Emu for long! There’s been substantial rain throughout Queensland once again this year and no doubt these birds, along with many other species, will take advantage of the situation. 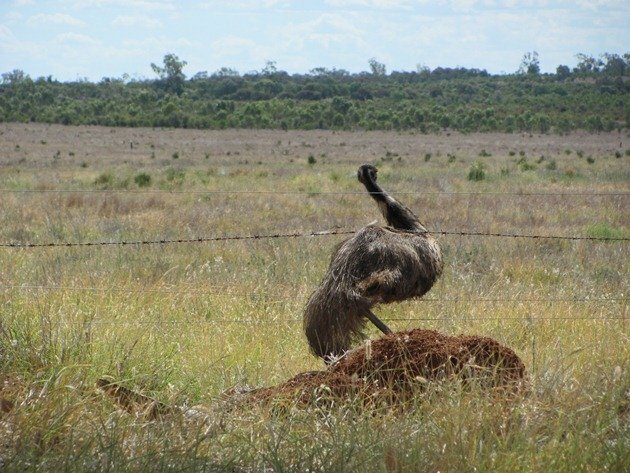 If you want to see plentiful Emu in Queensland now is the time to do it! Great post! What an amazing bird, so huge, so resilient, and so family-oriented. What an incredibly cool bird! Glad to read that this species of megafauna is so adaptable. Birds that wake you up…..